This blog is mostly about food and sometimes about books and crafts. I often get e-mails from readers, and the funny thing is that these e-mails are rarely about recipes or books or crafts. (Although I do get asked all the time what brand/model food processor I use). People want to know how I find the time to cook and read and indulge in my hobbies and blog. And it is a question that I never have a good answer for. Chapter 1: The Myth of the Time Crunch. Vanderkam points out that we live in a culture with a strong narrative of overwork and time starvation. I agree with this. It is a mark of success to be harried and exhausted and over-scheduled. We vie with each other to say that we worked the most number of hours per week and that we have 5 meetings back to back. When I chat with a friend, the first thing we say to each other is, "How are you? Oh, super busy, you know. Things have been pretty crazy". But sociological data shows that we overestimate time spent on work and housework and underestimate time spent watching television. 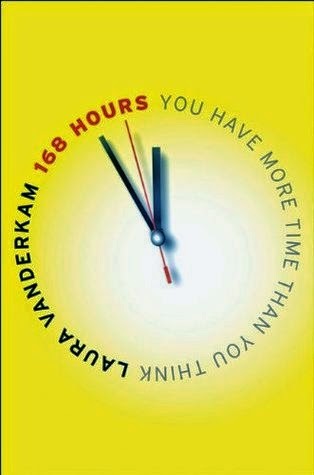 Vanderkam suggests that we start with a blank slate of 168 hours and very honestly and meticulously fill in how we spend our time. Here's what she says about not doing something that you want to be doing. "...it is a choice, and not a matter of lacking time. When you say, "I don't have time," this puts the responsibility on someone else: a boss, a client, your family. Or else it puts the responsibility on some nebulous force: capitalism, society...regardless, the power slips out of your hands". Bottom line: there is plenty of time if you make good choices about how to spend it. Chapter 2: Your Core Competencies. Know what you are good at and what you can do better than almost anyone else. Those are your core competencies and you are likely to do well in life if you spend more time focusing on them. Study your time logs and figure out exactly where you are spending your time and whether you're spending enough time on your core competencies. Try lots of different things that you think you might enjoy to help you identify what you are actually good at. She gives an example of someone who told herself that she would love to sew if only she had the time. One day she took the plunge and took a sewing class and did not enjoy it at all. At least now she knows to cross that dream off her list and devote her mental energy to other things. Instead of just dreaming of doing something, try it in a small way and see if it actually feels enjoyable or not. "There is extraordinary power in knowing what you want to be doing with your time. When companies execute with this clarity of strategic intent, they thrive. When people do, they thrive too". Chapter 3: The Right Job. "We spend a lot of our waking hours working...Like choosing the right spouse, being in the right job can give you amazing energy for the entirety of your 168 hours". Chapter 4: Controlling your Calendar, Chapter 5: Anatomy of a Breakthrough. These chapters are about working smarter and in a more focused, results-oriented way rather than filling time with pointless meetings and conference calls, say. "Do not mistake things that look like work for actual work". Most of the advice is geared towards people who want to climb the corporate chain, make business breakthroughs, gain that coveted corner office. But it is adaptable to other situations as well. Chapter 6: The New Home Economics and Chapter 7: Don't Do Your Own Laundry. The circumstances and realities of each person's life are different. The author's background is very affluent and there were things in this book that were very jarring for me. You see, Vanderkam's strong advice is to outsource housework. Laundry, cooking, cleaning and other "unnecessary domestic burdens" "take time away from activities that are among your core competencies" and should be avoided by hiring someone else to do them. Her solutions are breezy and one-dimensional- Spending too much time cooking? Hire a personal chef. Vanderkam's idea for those who don't like to wash dishes made me cringe: "...use paper plates and utensils, and then write a check to your favorite enviromental charity as atonement". To be fair, I grew up in middle class India where having maids, cooks and gardeners was and is quite normal. The system works if we have two classes of people- the ones who make the big bucks and the one who earn small bucks doing menial chores. My own choice in this matter is to do my own damn housework my own damn self, thank you very much. (Well, we're two adults in the house so we split the housework.) How about living simply and mindfully, taking care of yourself and your home and teaching your children to do the same? Now, I completely agree that it is all too easy to spend endless hours doing housework inefficiently. But chores can be minimized and streamlined and we try to find ways to do that. We buy easy-care clothing. We have a minimum of furniture and possessions and no knick-knacks that have to be dusted constantly. (A very good essay: the true cost of stuff). I make quick and simple meals that don''t dirty every pot and pan in the kitchen. We eat leftovers for lunch. Errands are grouped together. Shopping lists help to avoid frequent trips to the grocery store. To say that there are only two choices: (a) be stuck doing endless housework or (b) hire someone is incorrect. 1. Think of things you've always dreamed of doing and choose one or two or three activities or hobbies. Devote your leisure time to your chosen activities. 2. One of the activities you choose for your leisure time has to involve physical activity, because exercise is non-negotiable for good health. This one, by the way, was my biggest take home message/reminder from this book. I think I'm doing a fairly good job of using my time to create the life I want except that I'm consistently failing at exercising regularly. I really need to cut out my excuses in this department. 3. Align your time: Multitasking does not work, period. But Vanderkam talks about alignment where certain activities can be combined fruitfully, for instance, catching up with a friend at a playground while your kids play together or volunteering as a family. I definitely align my TV time and crafting time and enjoy both simultaneously. 4. "Use bits of time for bits of joy". Have a few enjoyable activities for small (10-30 minute) chunks of time, like keeping a book in your car to read while you're waiting to pick up your child at school, or writing poems or letters while commuting in the subway. Chapter 9: The Hard Work of Having it All. The author does a couple of "time makeovers" here and has tips to do this at home by logging one's time, creating a list of dreams, identifying one's competencies and devoting time to them, ignoring and minimizing things that you identify as time-wasters, and checking in with yourself regularly to see if your weeks are looking the way you hoped they would. All in all, this book has quite a bit of interesting content. It makes me very sad when people tell me they would like to do something but they just can't find time for it. Life is too short, time does go by and it is indeed a pity if we just dream of doing things (big and little) and never get around to doing them. I'll leave you with this quick recipe that I tried yesterday- a pasta salad much like this one I've posted before, but with a fresh kale pesto. There's some controlled multi-tasking in this recipe! 1. Roast the veggies. Preheat oven to 400F (convection setting if your oven has one). Cut assorted vegetables into bite size chunks (I used 2 zucchini, 2 red/orange bell peppers, 1 box of mushrooms). Toss with salt, pepper and olive oil and roast until tender and slightly charred on the edges. 2. Boil and drain the pasta while the veggies are roasting. I used 3/4 of a box of whole wheat shells. 3. Make the pesto while the pasta and veggies are cooking. a) Boil a small pot of water. Add roughly chopped kale (1 bunch) to the boiling water for 2 minutes. Drain. b) Roast 1/2 cup walnuts for a minute or two in the microwave. c) Blend the blanched kale, walnuts, 1 tbsp. nutritional yeast, basil (fresh/paste/dried), 2 glugs olive oil, 1 tbsp. balsamic vinegar, salt and pepper to taste in the blender to a smooth paste. 4. Toss the roasted veggies, cooked pasta, pesto together. Optionally, add jarred olives or artichokes. Taste and season with salt and pepper if needed. This dish is wonderful hot, cold or at room temperature. Perfect for lunch boxes and picnics. Happens to be vegan. Rice or quinoa would work well in place of the pasta. 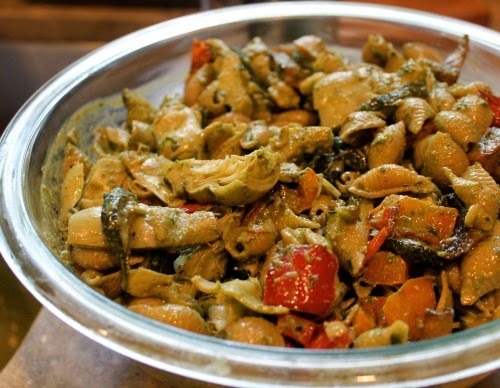 Or simply skip the pasta and use the pesto-veggie mixture as a sandwich stuffing. Possibilities! Is this time management stuff giving you a massive headache? Do you feel like you have time to do the things you love doing? Wonderful -- going to try out the Pesto! I, like the rest of your readers, am always in awe of the way you manage to do so many things in your day. This was a very helpful post. I agree that sometimes housework can be a big time sucker if it is not done efficiently. Do you have a routine or time table of sorts for house work like cleaning? My reply to you is in my post below- I clicked the wrong button! Hi Nikita- I have a routine of sorts for cleaning but we are reasonably clean and not sparkling clean for sure. I do a 5 minute tidy-up a couple times a day, walking from room to room quickly. Kitchen clean up (dishes, counters, sink) happens after dinner while I watch the evening news. It is great to wake up to a tidy kitchen. My husband does all the vacuuming, and having a top of the line vacuum cleaner was a great investment for us. Bathrooms get cleaned once or twice a week. That's it. Housework expands to fill the time available. Best to set aside only a few minutes to do it quickly, that's my strategy. Job-wise- you're in an interesting situation because you could take your life in any direction which is quite exciting. If I were in your place, I would make a list of several things that I enjoy doing (eg. working with kids, doing art, fundraising for a cause) and find volunteer opportunities to try them out and see if they might be a good career option. Being a computer engineer gives you a solid background even if you wanted to do something computer related such as setting up websites for non-profits. The world is your oyster, lady! You can be a stay at home mom for as long as you like while also learning more about yourself and what you are good at. If and when you decide to work for pay, you'll be ready to go. Thank you so much for taking the time to write such a detailed reply. That is really solid advice and I will work on it. My husband has also said something similar to this. This post resonated with me! I for one am really in awe with how much you get done in your hobbies department. Time management was never an issue for me (or us, as a family) because me and my husband are not into TV. We dont have cable and the only thing we do watch are occasional documentaries on netflix and movies sometimes. Apart from that, we both have always shared chores at home along with the cooking. We do live a minimalistic life, with very less furniture and clutter, so cleaning does not take much time. However, after having a baby, we are left calculating where all the time is going. With both of us in full time jobs, whatever small amount of time we get in the evenings is hardly enough to spend with the baby and each other. Add to it cooking and the day is over. Me and hubby often talk about this, and we have realised that the main reason we are left gasping for time these days is because little A (still) does not sleep through the night and wakes up 2-3 times at night. So, the moment he goes to bed at around 8, we make sure we hit the sack as soon as possible too. since his first stretch of sleep is the longest. Because of this, I am sleeping a lot of interrupted sleep (read, longer sleep time, but reduced quality of sleep due to waking ups). This has majorly cut down on the 2-3 hours at night where I would previously be awake with free time. I am hoping the sleep situation gets better as he grows up. Though I believe in doing most of the things ourselves, I know I am going to keep a cook when we move back to India. Neither of us enjoy cooking on daily basis and this is something I plan to do! Its also amazing how little free time makes you cut out on the less important things in the day. After experiencing time issues, facebook, corridor chatting with work colleagues, lunch with groupmates, internet surfing everything has reduced (for good!). Neha- you're so right that TV is the single biggest time waster if you're not careful. And yes, lots of time at work gets frittered away in chats and web surfing so working long hours may or may not correlate with productivity at all. I completely understand about your baby's sleep: it was and is the biggest source of exhaustion in my life because my little one still wakes up several times at night. But most kids do sleep better than that- hang in there! I love your blog and read it regularly, but don't often comment as I don't want to get into another activity that will require time committment. Being a silent reader does not require any committment right. I had to say this because of the topic you chose to discuss, as sometimes I feel bad that I don't take the time to appreciate your efforts as a recipient of it! On how I manage my time - Over the years being a full time working person, I know exactly what I can handle in my daily schedule. For example, I know that I cannot handle an exercise schedule outside my home like say a yoga class or even hiking with friends on the weekends. Going on a hike once in a while with friends is fun but being committed every Saturday and Sunday is not - atleast for me. What works for me is a walk during lunch time or exercise in front of the TV in my living room. I do my house cleaning like you - in small chunks, so it really doesn't feel like a chore. We have a cleaning lady who comes every couple of months and does the deep cleaning. I feel good that I am able to give her some income, while I am not totally dependant on her. Similarly we have a gardner now. My cooking is very similar to yours, a hodge podge of different cuisines, tailored mostly towards our kids preferences focusing on a balanced meal. I do a lot of prep and planning ahead of time so I can cook a meal in 30 - 60 minutes in the evening. Though I have to admit, that I am not enjoying cooking as I used to before. So I am just cooking the no brainer stuff (i.e, Indian food) more these days as opposed to experimenting with new and fun recipes. Our dinner is usually accompanied with watching a family favorite show - currently it is Chuck on Netflix and before it was Nikita and White Collar. My kids are in 10th and 12th grade, so they do not have a lot of free time, so we multi task and connect while relaxing with food and a good show. Though It is recommended that you don't eat dinner in front of the TV, this really works well for our family. We all de-stress and bond over it. I have had to give up on most of my hobbies for lack of time, but instead have had a great time being with the kids. Time flies and soon they will be off to college and I will have a lot more free time on my hands to do the things I have put on hold. I have learned that there is a time and place for everything and you might as well enjoy what you have to do. We don't have to follow the general guidelines or the popular trends but instead do what works for us and our family. That is how I manage my time. Thank you for chiming in! It is always nice to see what works for different people. I love how you and your family are bonding over a good TV show- planned and high quality TV watching as opposed to listlessly flicking through channels. Thanks for your wise words on doing what works for you. The book sounds VERY convicting....thanks for the synopsis!! As always, awesome post on time management. Very helpful tips. On how I manage time - Since both of us work full-time jobs, we hardly have time to cook during weekdays. Exercising anywhere from 3-5 days a week is a must for all of us. Yes, we struggled to get to this point, but we somehow have a schedule now and we all enjoy it. Hard to imagine a week without gym. Cooking is done mostly during the weekend. I come up with a couple of staple dishes (high in protein) and prepare few dishes that last until Wednesday. I chop all veggies during the weekend and refrigerate them in ziplocs and Thurs and Friday usually make one pot meals or end up eating out once in a while. Saturday we just manage with high protein burgers coz we head to gym Sat morning. Later we shop for veggies and again cook for the week. Like many others, I do sometimes struggle with the cleaning part. My husband is very helpful; so every other weekend, we just eat out for lunch or dinner and spend the entire day just cleaning bathrooms. Kitchen and other rooms get vacuumed on weekdays when we don't gym. When we have holidays where I get a 3 day weekend, that's when I try to sew or paint etc. Spending time with my son is precious for me. I'll get back to hobbies when he needs less of my time during his high school/college days. It is good to know that you can grow to enjoy exercise! I know other people who like you, cook on weekends for most of the week. Thanks for sharing how you've fitting the pieces of your life together- the mommy son conversations sound like fun! I too enjoy hearing from my daughter about her day: random stuff like she saw a shark and a whale in the wading pool. It really is the best part of the day. I love that you did this post Nupur!! I am one of those who has also been a long-time admirer of how much you seem to accomplish, in addition to keeping up with this blog. Thank you so much for doing such a lovely summary of the chapters - because it is really helpful for someone like myself who has always been terrible with time management. Though I've never been good with managing my time, I've never had an issue with finding time for things I want to do or be productive or get work done that needed to........until I had kids!! Its been 4 years, I've had two kids and I always feel like I can barely keep my head above the water. TV, hobbies, socializing - everything has slowly fallen by the wayside. It doesn't help that my kids are terrible sleepers. My older one has severe eczema - so wakes up multiple times during the night with bouts of severe itching. I haven't slept longer than a 4 hour stretch in the past 4 years. So I am a zombie in the daytime. Even when I do find time, I just don't have the energy. I know this is a phase, so I've just made my peace with it for now. I'm down to the basics. Its a good day for me when the family is fed 3 meals, some laundry and dishes get done, and 2 little people have been bathed, read to and played with. The rest just waits till I can get around to it! !I On the plus side, I get to spend a LOT of time with the kids and I love it. I'm using it here as a cheesy-tasting substitute for parmesan cheese. I always ask you how did you manage this with a toddler, pet , job .. feels awesome ! I hardly watch TV, but some planned soaps-sitcoms on my tablet or reading any book, takes turns before sleeping, so included in my 8 hours of sleep+rest+entertain. I work 8 hours for 5 days and commuting takes about 1 hour to and fro so 9 hours. I spend 1 hour daily, half hour in morn n half at night just doing some normal chores (I have help for cooking and cleaning so its normally just checking on other stuffs, tidying or just planning) and this is normally half hour before my son gets up and other after he sleeps. So except all this what I am left of is 60 hours a week which I spend with my son, either playing, singing, dancing, roaming etc. It’s already a guilt driven ride being a working mom, so just cherishing the time I get currently and not really thinking much ! So you really did the math! And isn't it amazing that even after work, sleep and housework, you have 60 hours per week to enjoy? To me, the data clearly says that you should be patting yourself on the back and getting rid of that guilt. All available evidence shows that kids of working moms thrive just as well as kids of stay at home moms. I have been a regular reader of your blog and am amazed by people like you who can manage their time to devote to activities they like to do. Essentially there are two principles which I follow to manage my time - First things first and then never spend time in doing something which you are going to regret tomorrow. Johanna- actually this book has pages and pages of stats that the time spent on housework has declined dramatically over the decades. There was a time not so long ago when people really did spring cleaning over weeks, for instance, scrubbing every inch of their homes. We're much more loosey-goosey now on the whole. I wish you much luck on your project- that's precisely the kind of important thing that can get lost in the shuffle of daily chores and unintentional time wasters. Like many others, I totally admire your time management skills. You're great at squeezing so much activity into a day. This post is so timely because just last evening my husband and I decided to fire the maid this month-end. I live in India, and I believe employing maids is more of a hassle than a convenience. Their unending demands, tantrums, working patterns and holidays are enough to drive any sane person nuts. I have made a decision of doing all the work myself. It's going to be hard because I'm not used to it and it is time consuming, but I have made up my mind to at least try. Let's see how that goes :) Would love if you can give me some tips on how to get housework (sweeping, mopping, dishes, dusting, etc) done quickly. India is truly going the America-way with regards to household help. I'm willing to bet it's going to be non-existent in a few years. And yes, the paper plates idea is preposterous!! Can you imagine what would happen to the environment if everyone thought the same way? Eeks. The pasta salad looks so yummy! Is basil or spinach an acceptable substitute for kale? About the pasta salad- yes, any greens/herbs would be perfect in place of the kale! You know, I know nothing of you or your maid but it pains me so much that you would describe it as unending demands and tantrums. Being born in poverty, working as a maid, I cannot begin to imagine what it must be like to live in their shoes. Just compare your salary with the maid's and your living conditions with the maid's. This is precisely why I am so uneasy about hired help, even though when done right it is a mutually beneficial thing. This is a great post and resonates so much with me. I find myself becoming more and more introspective as I get older, assessing myself, wondering if I am doing enough, trying to find a balance and so on. As a single parent working long hours I don't get a lot of spare time and what I have is spent with my child, constantly working on being a better parent. Sometimes I do well, other days not so much! In regards to maids, I have employed help back home in Pakistan and where I live now. I could not manage a young child and long working hours without help. I know without blowing my trumpet that I am a very decent employer, paying above the market rate, paying on time every month, ensuring my maid gets her regular time off, helping with family problems when I can and I did the same in Pakistan.Let me tell you, it is often a totally thankless task. At the end of the day a job is a job. In a country like Pakistan where there are such levels of poverty, I am continuously baffled at the absolute apathy towards work from people who desperately need jobs. They are so eager to have an income, you employ them, ensure they are well fed and have decent working hours (atleast that's what my mum and I do), pay a good salary, help with children's education and so on ands in the end all you hear are complaints and the next thing they walk out on you or steal from you-I have experienced both. To me it is simple. If you need to feed your family you work. And you try your hardest to keep that job. I have seen one of our employees (one who stuck it out and kept herself employed)steadily improve her poor living conditions, while working with my mother. Her salary is increased every year, she is much healthier than she was when she first started working for us, her children are in school, she gets vitamins and routine vaccinations and so on, and I advanced her money to help pay off her home. But she has worked for it with very few complaints and demands. I do not believe that being poor gives a person the right to pay games with a job that would benefit them so much. I may sound harsh but you have to experience it from the employers perspective to know. I also happen to know many people born into poverty who have worked like crazy to make better lives for their families and for them I will do anything I can. I side with the anon commentator and Amber on this topic. Very sorry to say this, but I am becoming immune to other people's sufferings. Sure, I have immense respect for those maids who live a life of hardship and extreme poverty. At the same time I've had so many experiences when I've felt betrayed after helping them out. Would you believe I gave away my laptop to my maid for free so that her children could learn how to use one but she didn't bat an eyelid before trying to flick money from my wallet? You know Nupur, I know exactly what you're trying to say, but once you experience something like this, it's hard to feel sympathy, empathy or respect for them. I'm not saying all maids are thieves, but sadly most of them are out to fleece you one way or the other. That's the harsh reality. Thanks for providing an alternate perspective, Amber and Purva. After reading this post, I got thinking... where do I waste my time? I realized that I have these bouts of energy, I do things quickly and then there are days, I ignore stuff ( like a crayon that is under the sofa, dang, I don't want to crawl and get it sort of thing). All this probably has to do with my emotions. The days I feel low, I feel like I want to crawl into a hole and die, those days it is difficult to get everything done, 3 meals, homework, activities, reading and done! That salad is very tempting, I'd like to try it with quinoa. Ah moods and energy levels do make such a difference to a productive day and a listless one. Everyone has ups and downs, I know I do and have spent many a day wiped out on the couch. But if the lows come too often or hit too hard, I'd discuss it with my physician- something as simple as anemia can be responsible. And I'd note what gives me energy and puts me in a good mood- foods/ long walk/ funny book/ a good conversation and use that to pull out of a funk. Great post and thanks for summarizing the book so well for us. My husband and I both work and I crib about not having enough time too. I have been thinking a lot lately about what you said about living simply. I feel like the more stuff one has, the more time we waste maintaining this stuff. I do take some drastic steps from time to time to cut out the "noise". I deleted my Facebook account two and half years ago and have never missed it since. I used to check it frequently throughout the day and it was so pointless. I did the same thing with my Twitter account 6 months later. I regularly donate our kids toys and clothes. This past week I have been unsubscribing from the zillion email lists I'm on, emails about good deals just make me want to buy more stuff. I also have a lady who comes to clean our home every two weeks. I don't exercise either and I was recently diagnosed with Sciatica so anything high impact is ruled out for the moment anyway. Because of that for now, I'm also doing the bare minimum to make our routine function. My big milestone birthday is coming up this Sunday and like you, have been a bit introspective these past couple of weeks. What you said about your job hit home too, I work full time, not exactly a high profile position but, as you said, I'm at peace with where I am. It's exactly where I need to be in this phase of my life. I sometimes wonder how single parents do it, they are superheroes or something. I also just wanted to add, you can think whatever you want about your job but, know that your blog and you are well loved and I feel a sense of community here. Hi Anu- Happy Birthday in advance and hope you have a wonderful birthday weekend! Your birthday is on Mother's Day which is doubly special :) Oh and I hope the sciatica gets better, that must be hard to deal with. I'm with you on culling the clutter/noise every once in a while with both physical and online stuff. The internet is a good servant but a terrible master. Thank you for that last sentence- it means more to me than I can say! Sorry to barge in like this but can someone tell me how to delete a Facebook account? I signed up years ago but find it a totally aimless waste of time and would rather not spend precious minutes looking at an endless parade of selfies. Personally, regarding the time management issue, I find the less 'free time' I have the more mindful I am about spending it well. I spend a total of 3-4 hours a day commuting but I travel on a lovely train with a nice window seat reading and working. Like you I have a birthday this week and I've been thinking a lot about how I want to 'time manage' the next few years. Let's see. Arpita- Good for you, turning a long commute (what might be miserable to some) into productive time for reading and working peacefully. Since I wrote this post, I've been going on almost-daily after dinner walks with my neighbor. But fingers crossed that I don't quit on that just like I quit on every other exercise routine. I must say after a long commute another 30 minute walk is a lot. As always, enjoyed your post dear Nupur and thanks for the capturing the essentials from this book on time management. It's so easy to feel overwhelmed all the time and yet feel like nothing major has been accomplished when you assess things.... So, you are right that we need to be more mindful of how we are spending our time. Btw, belated birthday wishes! Hope Lila is doing good. Take care. Yes indeed the daily chores are essential but they don't add up to anything significant. It is truly an art (but very necessary) to make time for things that will matter long term. Ah well we can all do better :) Lila is doing well, thanks for asking and many thanks for the birthday wishes! This is a great post! I read this book a couple of months back and it definetely resonanted with me. I have a full time job and a pre-schooler, and pretty much time is always as issue. One of the things I have done is reduce my social engaements. I do not feel the need anymore to entertain every week and if friends come over I make something simple instead of slogging all day showing my culinary skills. Althoug Vanderkham's advice about outsourcing is a little beyond what we are confirtable with (emotionally and financially), I do agree with it a little bit. we have outsourced our cleaning by hiring help to come in and clean every 2 weeks. This is huge time saver as otherwise we would be spending 3-4 hours every other week cleaning. I would also love to outsource making rotis but am yet to find somebody for this. The pasta sald looks yum! Great Post Nupur on time, I agree with Manasi above that there are days when I am just full of energy to do all chores, and there will be a day once or so when I don't do anything. To save time, I cook atleast 2-3 meals for the week on weekend or weekday. That helps save time and focus time on other things. With busy life at work, home, kids, I feel now somehow I have started to take bits of time for the things that I like to do. Those bits of time help me keep moving and enjoy moments:) Sometimes I think back why did I not think about doing those hobbies earlier, but never too late I guess:-) I tried the Kale Pesto Pasta, myself and hubby liked it, but kids not. I agree 100% with you that those bits of me-time are the key to boosting energy for the other parts of life! I'm sorry your kids did not like the pesto, I guess greens can be off-putting for many kids, eh? Great post, Nupur! I get Laura's newsletter but I do feel slightly annoyed sometimes with the super-affluent (like Laura and Gretchen Rubin) who come up with profound insights like "Money CAN buy you happiness!" But LV makes some good points. I recently started keeping a food diary and was shocked to see all the mindless calories I used to insouciantly consume before. Same probably goes for my time. A time log is a good idea. My list of to-make recipes is piling up! This one looks wonderful as well. Re: the maid issue, I feel your sentiments. I cringe to think of the children who used to work at our place (I felt horrible then too.) But a single poor mother with 8-10 children couldn't survive otherwise. It was (is) a terrible,evil reality in some places but we shouldn't become hard-hearted and complacent about it. Yes indeed R- if I start adding up the mindless minutes I'm reading "news" headlines on the Internet, I could take on a couple more hobbies ;) or I don't know, get some exercise already! I'm of course guilty of claiming to be very busy, but as a lifelong reader, it does bug me when people ask me how I have time to read. I have time to read because I make it a priority! You don't have time to read because it's not a priority in your life. And that's totally fine, but I think it's important to admit that. I try very hard not to say I can't do something because I just don't have time, because it's usually not true. Usually there is another reason. It sounds like an interesting book overall. Having help around the house is totally out of reach for me though. I just do my best to delegate chores to the rest of the household and group errands together when I can. I make the most of my Amazon Prime membership (free shipping) to save trips to the store. I manage to find plenty of time to enjoy my life, but gosh, don't we all want more! I think you're right though, the key to minimizing housework is not stuffing the house to the roof. I know I can pick up much faster when I'm in a regular routine of purging stuff. This summer is dedicated to emptying out the basement and garage. It's so easy to accumulate stuff!